Apple Chief Executive Tim Cook met with billionaire investor Carl Icahn for dinner on Monday night, in a meeting in which Icahn pressured Cook to initiate a $150 billion buyback of AAPL stock. Icahn revealed his proposal in a post to Twitter on Tuesday. He didn't indicate how receptive Cook was to the idea, but did say the two parties plan to meet again before the month is over. 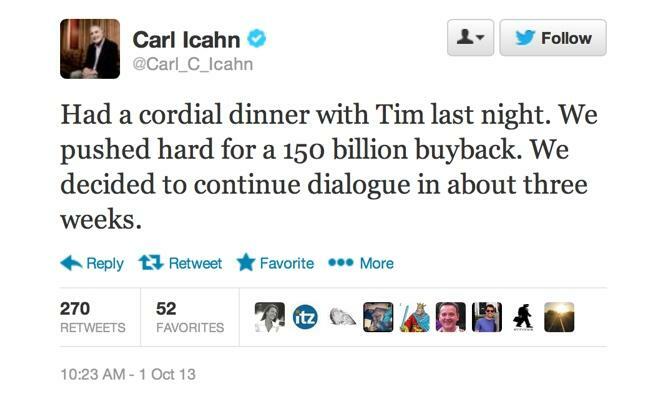 "Had a cordial dinner with Tim last night," Icahn wrote. "We pushed hard for a 150 billion buyback. We decided to continue dialogue in about three weeks." The two parties had dinner in New York City on Monday, with Icahn pushing Cook to invest more in itself. He has previously said he believes shares of AAPL are "extremely undervalued" at their current price. Icahn announced his bullish view on AAPL in August, an announcement that helped push shares temporarily past the $500 threshold. But they have since fallen back below that mark, and are well below the company's high of $702.10 reached a year ago. Apple already has a share buyback program in place, in which the company plans to spend $100 billion in the next few years on it as well as an increased dividend. But Icahn believes Apple should spend more of its considerable cash and reserves on its own stock, particularly at its current price. With the two parties set to talk again in three weeks, those discussions may come after Apple's next quarterly earnings conference call, which usually happens in the third week of October. It's possible that Apple could use that conference call to announce changes to its dividend or share buyback programs, or simply provide investors with an update on its cash position.